Four Palestinians have died from wounds incurred during last Friday’s weekly protests across the eastern borders of the besieged Gaza Strip. According to the Ministry of Health, the Palestinian fatalities from the December 19 demonstrations included Ayman Munir Shbeir, 18, from Deir al-Balah, who died the next morning of wounds he sustained during the protests in eastern al-Breij. A second teen identified as Muhammad Muin al-Jahjouh,16, was killed after being hit in the neck by a live bullet fired by an Israeli soldier in eastern Gaza City. Maher Attiyeh Yassin, a 40-year-old disabled man from al-Nuseirat was also shot in eastern al-Breij and died of his wounds. The fourth fatality, Abed al-Aziz Ibrahim Abu Sharia, 28, from al-Sabra neighborhood died from a bullet wound to the abdomen he sustained along the eastern border of Gaza City. At least 47 other Palestinians were injured either by live bullets or rubber-coated steel bullets, while dozens suffered tear-gas asphyxiation as Israeli forces suppressed the 39th March of Return on Friday. The Ministry of Health indicated that four paramedics and two journalists were among those injured during last Friday’s carnage. 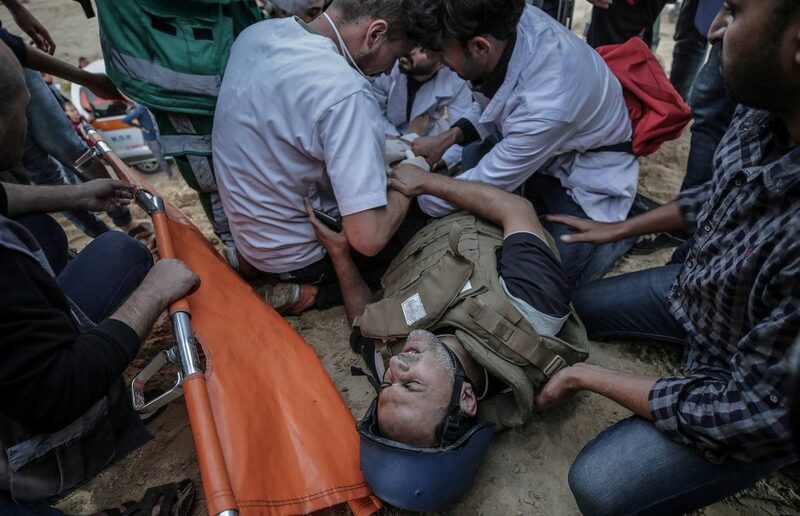 The latter professionals join three other Palestinian media workers wounded since November 19. Rashid Rasheed, a photojournalist and cameraman for the Associated Press, was hit in his left leg by a live round fired by Israeli armed forces while covering a protest on a beach near the border fence west of the northern Gazan city of Beit Lahia on November 19, 2018. This incident, protested by the AP, was covered in news reports, was shared in videos and pictures among other journalists on the scene and disseminated via social media, and was formally objected to by the regional press freedom group Skeyes Center for Media and Cultural Freedom. Saber Nureldine, a Palestinian photographer who was at the scene and is the managing director of the European Pressphoto Agency in Gaza, related how that day’s demonstration was coming to an end and most of the protesters and journalists were leaving the scene when they were surprised by the sound of sniper fire. “There were only a few photographers left and we heard a sniper shooting in the direction of some young men, some of whom were injured. Our colleague Rasheed was about 700 meters away from the border fence when he was hit in his left leg. We rushed him to the Al-Shifa Hospital in Gaza for treatment. With the help of the Associated Press, he was subsequently transferred for surgery to the Hadassah Hospital in Jerusalem. Rasheed had previously been injured while covering protests and had been on medical leave for six months [prior to his being shot on November 19]. He returned to work barely a week earlier,” Nureldine added. According to the Associated Press, for whom he has been working since 2002, Rasheed was operating a live camera on an elevated area overlooking the protest and was clearly identified as a journalist. In fact, videos and pictures taken at the scene show that Rasheed was wearing protective gear that identified him as a journalist when he was shot. In a separate incident, Attiya Darwish, a photographer for the Palestinian National Authority-affiliated Al-Rai News Agency, and Mustafa Hassouna, a photographer for the Turkish state-run news agency Anadolu, were hit respectively by a gas canister and a rubber bullet to the leg while covering protests against the Israeli occupation in the Malika area, east of Gaza City, on December 14, 2018. Hassouna related how, while he was covering the clashes between the Israeli Army and Palestinian protesters near the border fence, Israeli troops began to fire tear gas on the protesters. “I was suddenly hit by rubber bullet fired by the Israeli Army and fell down. I could no longer stand on my leg. I was taken to an ambulance that evacuated me to Al-Shifa Hospital in Gaza for treatment. I had a wound and a bruise and a sharp pain. After two hours I was discharged,” he added. Israel military spokespersons did not reply to requests for comments. Since the Great March of Return protests began on March 30, 2018, at least 20 journalists have been hit by live ammunition fired by Israeli forces, two of whom — Yaser Murtaja and Ahmed Abu Hussein — later died of their wounds.